Ah, Fashion Week. The energy is insane during these seven days of nonstop glamour... Whether you are attending as a writer, editor, photographer, or blogger (hello), this eventful week can - and will -have you running around manhattan from early morning to late at night. It may not sound impossible, but there are tricks to staying energized, professional, and presentable at all times. Don't enter the chaos unprepared. 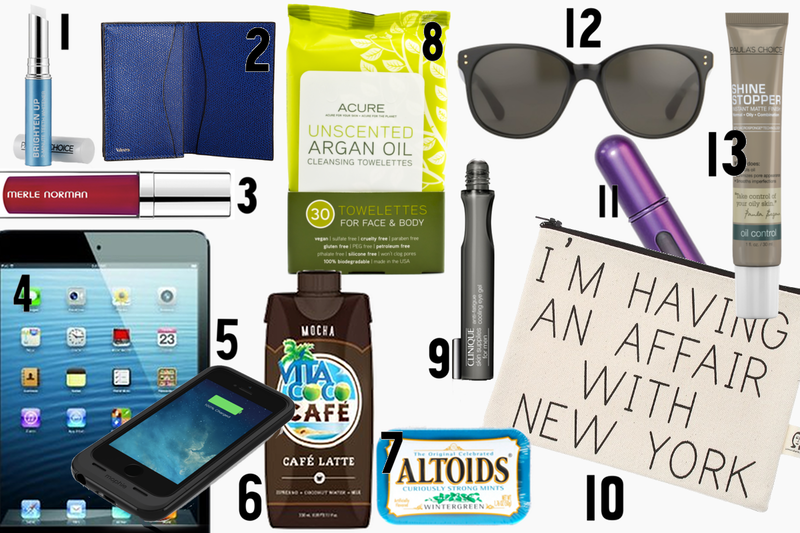 Here are 13 essentials you may not have thought of to put in your bag that will most definitely help you survive NYFW. Good luck! Can't wait to see you there. 1. Paula's Choice Brighten Up - There will be tons of photos, which means tons of smiling. Remove those coffee stains in just two minutes with this baby. 2. Valextra Business Card Holder - You're going to meet a lot of new business connections. So you need a simple and chic way to carry your business cards. 3. Merle Norman Liquid Lip Color (in Siren) - Ladies, it's fashion week. Bond lips or nothing. 4. iPad Mini - Such a convenient tool. Snap pics, take notes, and answer emails. And, it's so easy to carry! 5. Mophie - Please, there's no way a standard phone battery can survive New York Fashion Week. 6. Vita Coco Cafe - Stay energized! Definitely a handbag must have... You will need it when there's just not enough time to run to Starbucks. 7. Altoids - Two words: Coffee. Breathe. 8. Acure Unscented Argan Oil Towelettes - You're on the go from 6am to 10pm (if you skip the after parties), with very little time to recharge. These are so handy for a quick refresh - most likely in the back of a cab. They are the perfect size for your carry all bag, and they're vegan! 9. Clinique Anti-Fatigue Eye Gel - Okay, so the tube says it's for men... But who cares. Anyone can use it. It's just so amazing. Long days, short night. Trust me. You will need something special to combat those dark circles and puffy eyes. 10. Pamela Barsky Pouch - Don't just throw everything all willy-nilly in your bag. Try to stay organized with one of these perfectly sassy pouches. 11. Travalo - I adore these! The perfect travel-sized, refillable fragrance container - when you just need a little spritz before a show. 12. Linda Farrow - Whether you are seated at a show or walking the streets of manhattan, you need fierce shades. We can all agree that no one does fierce shades like Linda. 13. Paula's Choice Shine Stopper - Stay beautiful and oil-free with this must-have from beauty show stopper Paula's Choice.